Trendy Mannequin. 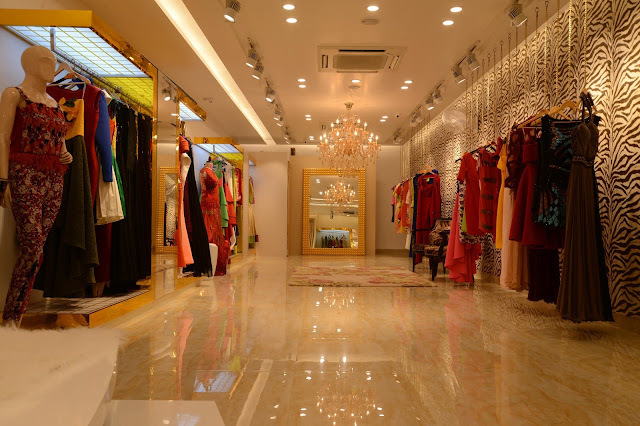 : Diva Rose by Simran Aggarwal- Store Launch. Diva Rose by Simran Aggarwal- Store Launch. On the right side of the store, you'll find the pret and couture collection. The pret collection lies between INR 10,000- 25,0000 whereas the couture collection ranges from INR 25,000 to INR 1,50,000. I personally loved the pret collection. The colors used for this collection were so so so pretty and the textures reminded me of Serena Van Der Woodsen's dresses from Gossip Girl! Diva Rose's pret collection is all about peplums, cut out dresses, off shoulders and every such detail which fascinates the age group of 18-25. This orange peplum cut out dress was the winner of the evening for me. As soon as I laid my eyes on this dress, my heart was stitched to it. The couture collection was not like any usual couture collection. Gowns had a modern touch, backs were made of sheer net, capes had exquisite thread work. In a nutshell, there were designs many had never seen before. And the best part was, this was all quality work. The different types of materials used felt so soft and comfortable to the skin. Those who are on the lookout for something fresh and crowd pleasing, pick Diva Rose. Trendy Mannequin gives it a big thumbs up! Waw! Nice photography. Thanks for sharing. You can make an e-commerce product by useColor Correction Service. Its to help make a attractive photo. Excellent outlet. All dress are aristocrat. Thanks for sharing such a beautiful and lovely post. If you need to ghost joint or background removal service then contact with us. Nice collection of dresses and your capturing photos is so beautiful . E-commerce image editing is very crucial on e-commerce business.Thanks for your post.